Giving Hope Lawn Management offers professional grading service and sod installation services. We offer free consultations and quotes. To get your free quote call us today. Before any structure can get built, you need grading services completed first. But some service companies only provide specific options. When you require complete yard grading and installation services, it helps to hire one firm for all your needs. And in the greater Richmond, VA, area, there’s only one name you should trust. Giving Hope Lawn Management remains the top choice in complete grading services. From start to finish, we still achieve better results since 2011. Professional grading is one of the most important aspects of construction. Don’t leave this crucial step to just anyone! Call today for your best lawn installation needs. We offer only the best quality each time! Finish grading is the final step in getting your lawn ready for everyday life. At this point, all construction has finished, and now the yard can get installed. That type of grading also involves how the yard will get shaped, as well as proper water drainage. 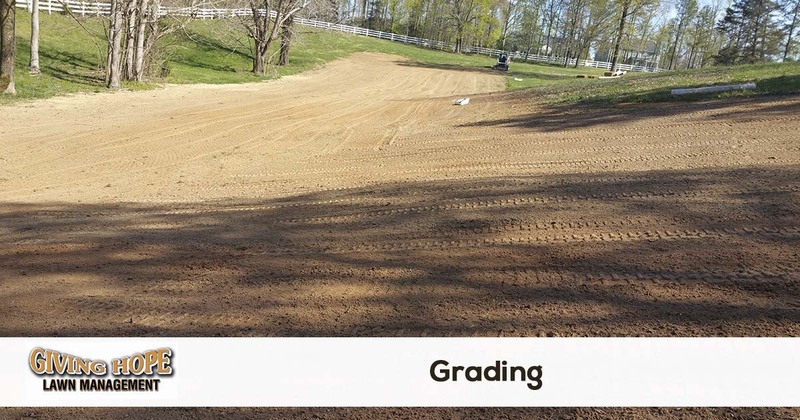 Without finish grading, your lot is just not ready for use. Unfortunately, some companies only provide rough grading. But our team handles complete lawn services, from the design stage to the final product. We help create your perfect yard no matter the project scope! When you need an expert team to complete your yard, you need our team working hard for you. Call today for your best finish grading and save more! Sod installation services require an experienced team to handle it correctly. Your new yard involves soil balancing, cut sod, and careful placement. If not done right, you can have an entirely new yard that goes brown in a few weeks. And then comes the added expense of having it done all over again! Instead, we save you more each time with expert service and better care than anyone else. For over seven years, we’ve helped more yards look their best! You can’t trust your sod installations to just anyone. Call the team that gets the best results possible each time! Rough grading is the yard preparation service most companies offer. That type of service prepares the soil for your building construction. Rough grading sets the stage for moisture drainage, as well as how the final yard will appear and perform. But like any other service, there’s a correct way and a wrong way to do it. Improper rough grading can lead to future water damage to your home’s foundation. And when slab cracks appear, it can cause devastating results! Instead, you need our team to give your home the care that it deserves. For the best options in rough grading and professional yard installations, just leave it all to us! When you’re planning a new building project or yard installation, you need Giving Hope Lawn Management to assist you. Call today for your best grading and save! Ready to have grading done on your property or just need a quote? We make it easy to get a free quote and schedule your service. All you need to do is request a quote online or give us a call today!